The issue of “module activation” vs. “global pattern dynamics” should be kept in mind while reviewing the evidence for specific regions as crucial to biological models of sensation or perception. Nonetheless, for researchers investigating the neurophysiological basis of access to interoceptive information or body-knowledge focus on a number of cortical areas of interest, particularly somatosensory cortex, orbitofrontal cortex, insular cortex, and cingular cortex/cingulate gyrus. The somatosensory cortex or (S1) is conceived as containing “maps” of body surface areas. A standard interpretation would explain the perception of touch, temperature, and pain as occurring through sensory nerves, which are joined into the spinal cord, and which eventually route through the thalamus, and then the cortical region known as the postcentral gyrus. 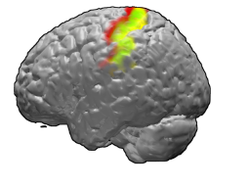 One standard refinement to the traditional model gives the label “primary somatosensory cortex” only to the area shown in red, Brodmann area 3 (Kaas, 1983). In any event, primary somatosensory cortex/S1 is conventionally modeled as having four complete maps of the body surface. Arguably, the biological/anatomical grounding of this concept allows one to state that the somatosensory cortex/SI contains “multiple representations of the sensory surface of the body,” without running the risk of invoking representationalist epistemologies, with their polymorphous and “mentalistic” significations. Over time, a picture has emerged of sensation occurring on the outer surface of the body, and then activating S1: neurons in these regions are firing (generating electrical discharges and secreting “signaling” molecules across synapses) at a higher amplitude. Any model that accounts for how perception and awareness of the body is possible will likely need to reference the role of somatosensory cortex. 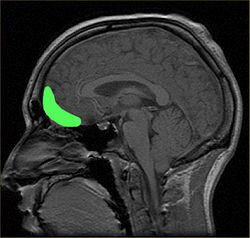 Another cortical region implicated in interoception or internal perception is that part of the frontal lobes known as the orbitofrontal cortex, which can be defined as that part of the prefrontal cortex that receives certain key afferent projections from the thalamus (the so-called “gateway to the cortex), which receives afferent projections from the body, including the visceral organs. In theory, enhanced activation of physiological state (such as heart rate increase) should be reflected in increased activation of orbitofrontal cortices. Studies of the role of cortex in processing internal body state often emphasize the role of the (formerly) obscure structure known as the insula, a cortical structure which is nonetheless tucked away underneath the visible cortical layers. The anterior portion of the insula is especially implicated in interoception and internal body-state “information gain”. Yet another specialized brain area becomes more active in those psychophysiological processes involving internal body state dynamics: a collection of white-matter fibers known as the cingulate gyrus of the cortex. Again, it should be stressed that neuroscientists may debate the extent to which any one region’s activity should be privileged against global overall processes. Certainly, S1, orbitofrontal cortices, anterior insula and anterior cingulate gyrus are only one of a series of regions that play a part in allowing visceral perception, interoception, or a gain in information about the inside of the body. Emphasizing the contribution of such discreet areas carries forward the “modularist” tradition, while other models will stress more of a global or holistic system of interactions, which is a classic debate in psychology and neurology (Gardner, 1985). Arguably, the pre-understanding of how much processing is done by local “modules” as opposed to collective and global activities influences the very means of data collection (Freeman and Holmes, 2005).